Fill in the gaps to complete the high score bar chart for IELTS writing task 1. Use the completed bar chart report to model your own writing as it gives the right structure to use and a good range of sentence structures and language. Below are useful sentence structures which are commonly used for bar charts for each paragraph (the introduction, overview and body paragraphs) to make up a complete task 1 writing model. You will see a full report for the bar chart below and you must fill in the gaps to complete it by using the correct verb in their appropriate form. 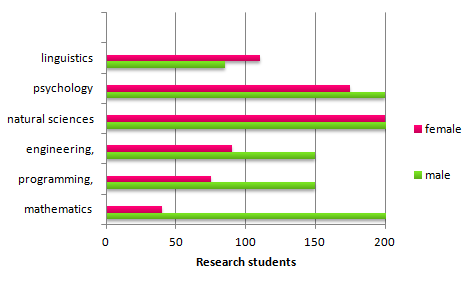 The bar chart below shows the number of research students studying different subject in 2005. Fill in the report below using the following verbs. You must put the verbs in the correct form and tense. Each verb can be used more than once. The bar chart (1). ………………… how many male and female research students (2). ……………….. six different subjects (linguistics, psychology, natural sciences, engineering, programming and mathematics) in 2005. Overall, there (3). …………. more male research students than females in 2005. Although the most popular subject for both genders 4. …………..natural sciences, men least (5). …………….. linguistics and women (6). …………. little interest in mathematics. Linguistics was the only subject that 7. ………… favoured by women more than men. There was a similar number of men and women in three subjects. There were equal numbers in research students (200) (8). ……………….. natural sciences. There was a difference between the genders of about 25 in both psychology and linguistic with more women (9). …………….. linguistics (around 110) and more men taking psychology (200). A difference of about half (10)………… evident in engineering and programming where 150 men chose both subjects. By contrast, 200 men selected mathematics which was approximately five fold that of women (about 40). Hey Liz, I’m learning alot from your blog but I have a query. Is it okay to draw a conclusion from the given chart like you have done here. Can we write ” The most popular subject” , “the least favoured mode of transportation” and so on? I have read somewhere not to do this. What do you suggest? It depends on what the chart shows. “The most popular” means that the main proportion of people liked it – you only use it if the chart is about liking something. If it is about, for example, participating in sport, that would not show liking. Choose your words carefully and make sure you are using words that relate to the information shown. I extend My deepest regards for you. I have learned only through your lessons and I got 7.0 in IELTS Thanks a ton.Your trainings us for free, that’s really great. Keep rocking. I have a question for writing task 1. Let us say we have a list of countries displayed in a graph or chart to comment. Would You encourage using a nicknames to name some of those countries? For example the United States could be called ” the Country of Uncle Sam”; France could be ”The Hexagone”; Canada could be the Great White North; China = The red dragon etc. By the way, thank You for all your efforts on helping people like that. I am a new kid on the block would like to read more comments regarding Writing Task 2.
mam plz explain table chart through video. How about this introduction “The bar chart illustrates the comparison between male and female research students in six subjects (name of all subjects) in 2005. You don’t always need to write that sentence. In the opening line, it is clearly about the number of students so you don’t need to be repetitive – the units of measurement have already been established. Hello, Maam Liz…I am having a difficulty on clustering my data in Task 1 , can you help me or give me some tips on how can i improve it . Thank You . Hi Liz! i think there was only one subject which is natural sciences showing equal number of male and female research students. When you select and group information together, you aren’t looking for groups that are exactly the same. Instead you look for similarities – things which is similar but not completely the same. This also means you need to be careful with language and use the word “similar” instead of “the same”. Thank you so much Liz for your great effort. Actually I can’t understand the difference between ” studying” and ” studied” in the second gap!! Could you please explain the difference between them? I did love your cognitive lessons. I really wanted to buy your in-depth lessons to learn better strategies. However, I am in a bit of quandary regarding if it only one tutorial for $19 or does sum cover the whole tutorial section including all types of questions and is it one-time transaction? Each lesson covers one type of essay as shown in the title. Once you buy the lesson, you can watch it as many times as you want. The chart illustrates the number of research students from the two genders studying six subjects (linguistic, psychology, natural sciences, engineering, programming and mathematics) in 2005. Overview, number of male students is more than the females in the most of the subjects. Both gender have high number of students in natural sciences, whereas the less number of pupils was linguistics for men compered to mathematics for women. there is significant different between the two genders in most of the study fields. In term of the males, most of them study mathematics, natural science and psychology, which there is 200 student in each field. There is also, equality in the numbers of students in both of the engineering and programming (just about 150 student). Moreover, there was less than 100 student in the linguistics studies. On the other hand, females were concentrate in the natural science and psychology (about 200 students and less than 200 students respectively). Then, there are more than 100 students in both of the engineering and programming studies. furthermore, the less number of female students is in the mathematics (less than 50 student). and how can we connect with you always ?? Sorry I don’t give feedback on writing. You can connect with me any time on my blog or youtube channel. Thank you so much for every single great work you have done. You can write “the number of people studying” or you can write “the number of people who studied”. I Asked you because the answer for the second blank is (studied) and I think that the right answer is (studying). Yes, that’s right. “How many people studied”. What tense should I use in describing a bar chart if IELTS did not mention the year? Usually you use present tense is not date is given. However, as long as you use the same tense throughout, you will be fine. Thank you very much for your lessons. I have a question regarding the answer no.2, why don’t you use studying instead of studied? It shows that the first three are more similar than the last three which show either a half or more difference. Sure, that’s absolutely fine. Well done! Thank you for your great lessons and feedback. Its very helpful for students who do self study like me. I would like to ask one doubt regarding the above chart. In 8th and 9th filling the blanks you answered with “ing” form (learning or studying). Can we use “learned” instead of “learning” even though, you have used simple past in the starting of the sentence ( there were equal number in research students……..) because the data is in year 2005. No, you can’t use “learned” in that sentence. You could write “there were equal numbers of students who learned…” you need the clause “who”. Thank for your help. But I’m quite confused about the last paragraph. Is the linking word ‘by contrast’ appropriate? Because I think there was no relativity between the former sentence and the latter sentence. Can I replace ‘by contrast’ with ‘what’s more’? Additionally, for ‘which was five fold that of women’ in the last sentence, I don’t understand what ‘that’ represents for. Is ‘that’ refer to means ‘number’? But there was not any word meaning ‘number’ in the sentence. I am always not good at contrast by times. The linking device “by contrast” was used because those sentences focus on the differences. While one difference was only half, the other was much much more (one in five). The linker “what’s more” is not academic and should never be used. It also does not highlight any difference. Your second question about the use of “that” refers to the number of women. It’s a useful phrase to learn but only if you feel, you can use it accurately. If you want to use simple contrasts, you can write “five times more than the number of women”. It’s is still considered complex language but it is easier to use. Thank you for pointing out that “what’s more” is not academic because I actually used the phrase quite frequently before. I will give up using it! Firstly, thank you so much for your job! your teaching abilities are awesome! All of the lessons are clear to understand with perfect understandable pronounciation! But there are some argues about “overall” paragraph. Do you suggest to write it right after interduction or it also possible to finalise with it (50/50)? I wonder whether “overall” mean “summerise” or “take a look”? “Overall” is used to indicate the overview which the examiner is looking for. The overview is the most essential paragraph in your task 1 and the examiner needs to find it easily. It should contain the key features of the chart. I would like to ask you about how can I write and compare two charts ? You’ll find a model for a pie chart and bar chart in the writing task 1 section. Here is the sample sentence: According to the bar chart, worries about their children’s future caused stress of those questioned. Could you help me to complete this following sentence, please! According to just under 30% of the sample, concerns about their children’s future _________________________________________________________. Sorry I can’t comment without seeing the actual chart.